Are you sure about that? Looking at the site linked above, I see the 1.12 proof of concept says it was built against Forge 14.23.0.2491. On Forge's official site, I can tell it to "show all versions", and if I scroll down almost to the bottom, that build is still there to download. please apdate to the version 1.12.2 PLEASE!! There is a carpenters blocks for 1.12.2 but it is experimental. Why you may ask well because the blocks still don't load textures and only has 3 blocks in the mod so far. Thank you for listening. Please, update it to 1.12.2!! They have posted an expermental version for 1.12.2 on their website. Okay, this is going to sound idiotic but I just can't seem to get this mod to work at all, and neither can my wife. We installed it alongside a few other mods and, upon trying to use it, noticed that none of the recipes work. It won't even let us BUILD the carpenters block. Should I list the mods we have and the version we have? 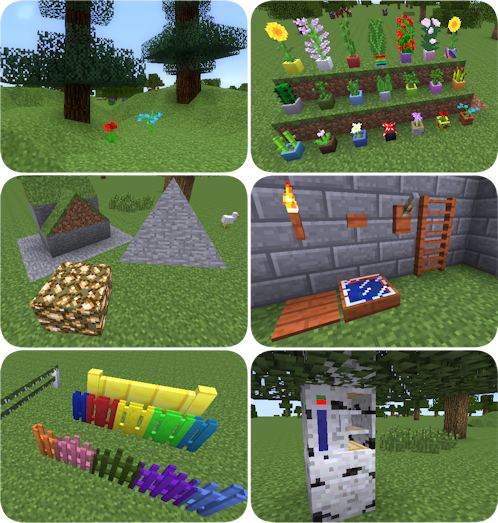 mods: forge, biomes o' plenty, harvestcraft, optifine, journeymap, and inventory tweaks. We're on the latest version of minecraft. This is only for 1.7.10.
they'll officially port it to 12.2 when they get all the new features they want added in and working correctly. for now you'll just have to enjoy their work in progress model of the 1.12.2 mod instead; which still carries all the old features the mod is famous for. -- but be warned that you still cant port a pre-made world from the 1.7.10 era to 1.12.2 and expect it to work; even with this version of the mod installed, too much has changed in the coding to allow that sort of thing, which is why the author intends to upload the finished 1.12.2 version as a separate mod - to my understanding - so people dont confuse the two and assume they can port their old worlds. because they wont be able to ever. If you don't like that fact then you can thank mojang's changes for that.Every mod from 1.7.10 and below can't be directly port upwards due to coding changes mojang inforced; which forces mod authors to rebuild their older mods from scratch for minecraft versions 1.8 and beyond. when I place a carpenter block of any kind it appears glitchy and bugged out, any help? Thanks for the support (mostly everyone!). Progress has slowed a bit during the slopes port, but in the end they will be what everyone always wanted; that is, capable of rotating all different directions. And, adding new slope types is a breeze compared to the old way.